76.2 mm/23 Mk71 х 1 pcs. Wickes — American Tier III destroyer. At first glance, Wickes might appear a downgrade from Sampson, particularly given her low health pool. While she is slightly more fragile than her predecessor, she makes up for it by retaining Sampson’s handling characteristics while gaining about 5 knots worth of top speed. More importantly than that, Wickes moves up from Sampson’s twin double-tube launchers on each side of the ship to twin triple-tube launchers. Combined with the better damage from her upgraded Torpedo module, it is a huge increase in firepower. Wickes is a tremendous threat to enemy capital ships she's allowed to close with; however, now she can simply wipe them out with a single well-aimed salvo of torpedoes as opposed to Sampson’s steady "death by a thousand cuts" method. Her main battery is virtually unchanged from Sampson; the guns are the same, and she retains the unusual gun placement that prevents her from getting more than three barrels on target at once. Overall, Wickes packs more firepower into a hull that is just as fragile as her predecessor, while continuing to encourage clever positioning and sneak attacks from behind cover in order to maximize damage from her deadly torpedo armament. Able to drop waves of torpedoes from both sides. Gun reload is a on the slow side. Virtually no armor (as is typical of destroyers). Guns are arranged such that only 3 can be brought to bear on a target at a time. Torpedoes are out-ranged by both German and Japanese counterparts (G-101 and Wakatake, respectively). Even less health than Sampson. Hull: Upgrade to Hull (B) for a few more hit points and slightly more AA. Research of this module unlocks progression to Clemson. Torpedoes: Upgrading to the Bliss-Leavitt Mark 9's provides Wickes’s torpedo armament with a major boost in damage and a little more range on her fish. In an odd twist for American destroyers, the best place to spend initial experience gains in Wickes is in the upgraded Torpedo module. Hull (B) provides a smidgeon more health and should be taken next. The Fire Control System module upgrade to boost her gun range can be saved for last. Priority skills for any Wickes commander are Preventative Maintenance at Level 1, Last Stand at Level 2, Survivability Expert at Level 3, and Concealment Expert at Level 4. The premium versions of Damage Control Party ( ) and Smoke Generator ( ) are recommended; the premium versions of Engine Boost ( ) is nice to have, but not necessary. The Wickes was a class of destroyers designed during World War I. As the successor to the Caldwell class, the primary improvements consisted of increased range and speed, resulting in a heavier ship with little increase in combat power. They were intended to operate in conjunction with the future Omaha class cruisers and Constellation class battlecruisers, forming the light component of the fast heavy units which the navy was expecting. 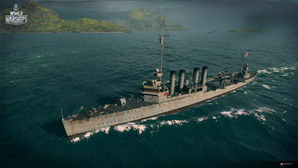 Of the Wickes class destroyers, the majority were completed after the end of World War I and consequently saw little service outside peacetime environments. Many were laid up or stricken from service as the newer, more modern generation of destroyers began to enter service in the 1930s. The entry of the United States into World War II saw the recommissioning of dozens of the Wickes class destroyers. Because of their age and obsolescence, conversion from fleet destroyer to more specialist roles became common. All four 102mm rifles landed, replaced by six (6x1) 76.2mm rifle. Aft torpedo bank (2x3) landed, replaced by two of six (6x1) 76.2mm rifles. Extra depth charge equipment installed, including K-guns. Both torpedo banks (4x3) landed, mountings for four LCP(R) installed. Stern rebuilt to accommodate minesweeping equipment. Both torpedo banks (4x3) landed, replaced with stowage for 80 mines. USS Bernadou (DD-153) in Measure 2 camouflage. She has been stripped down (masts removed) and modified for close-in support of the Torch landings in North Africa. USS Talbot (DD-114) as built, interwar paint scheme. A view of "Red Lead Row" in San Francisco harbor, 1920s. USS Biddle (DD-151). The removal of the aft mast, absence of aft funnel, and absence of aft torpedo bank indicates modification for ASW duties. USS Dickerson (DD-157) after APD conversion. Aft mast, forward funnels, and both torpedo banks have been removed. Davits installed and four LCP(R) loaded. USS Dent (DD-116) as built, in WWI dazzle camouflage pattern. USS Breckenridge (DD-148). Her mainmast, aft funnel, and aft torpedo bank have been removed. Note the additional ASW armament, including K-guns. She retains her 102mm guns. An excellent colorized photo of USS Roper (DD-147). She is modified for ASW duties and possesses the 76.2mm gun arrangement. USS Ward (DD-139) afire after Kamikaze attack. She would later sink, three years to the day after initiating the opening engagement of the Pacific War against a Japanese midget submarine outside Pearl Harbor on 7 December 1941. USS Crane (DD-109) as built, interwar photo. USS Chew (DD-106). An excellent photo exhibiting ASW conversion. Her aft mast, aft torpedo bank, and aft funnel have been removed. Her enhanced ASW armament, including K-guns, are clearly visible. She retains her 102mm armament. USS Herbert (DD-160) as built. Note the awning framework which has been put up over the forward gun.